Soirée en Blanc: Coming to York County Sept. 29! Don’t miss out on magical evening with Sister Cities Yorktown on Thursday, Sept. 29. 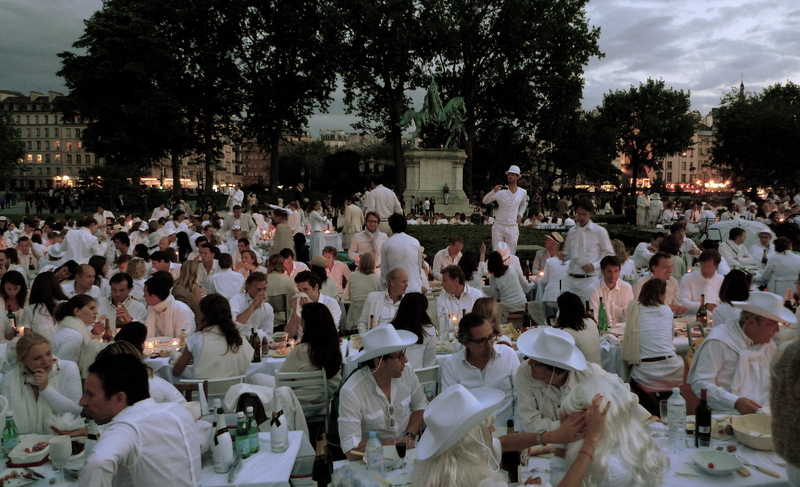 The new event, “Soirée en Blanc,” or a diner in white, is distinguished by the fact that the venue’s tables and guests are dressed fashionably in white – no shorts or flipflops! The event is based on a 30-year tradition that began in Paris when a gentleman wanted to entertain a group of friends he hadn’t seen in a while. He selected a secret location and told them to meet at a predetermined place and to wear white so that they could find each other. annual event now draws 10,000 people. This is how it works. Guests make reservations and pay a minimal entry fee. (Even better, gather some friends and buy a table for eight!) Guests bring their own picnic food, soft drinks or wine (no hard liquor), white plates, flatware, white napkins, glasses, and white table decorations. Sister Cities Yorktown provides tables, chairs, white tablecloths and entertainment. (A table of friends can coordinate a special menu, with each member bringing a dish.) The location remains a secret until two days in advance. That is part of the fun, so your email address is essential when you make your reservation. Tickets are $15 for members or $20 for non-members. A table can be purchased for $150. The event will take place from 6 p.m. – 9 p.m.
TICKETS ON SALE NOW, but sales close by midnight, Monday, Sept.26. Space is limited to 100 people, and it’s filling up fast. No tickets will be sold at the door. Proceeds support Sister Cities Yorktown, most importantly, student and citizen exchanges with our twin village of Port-Vendres, France, and grants to York County Schools.